The Head Chef of Caxton Grill at the St Ermin’s Hotel, St James Park, is none other than Adam Handling. Remember him? If like me you were a big fan of Professional Masterchef, you would have probably been devastated when Adam failed to win the 2013 series. The ambitious and highly inspirational Scottish chef was probably the most deserved of the title, but unfortunately he failed to pull through on the day of the final. But onwards and upwards as not winning Masterchef hasn’t held Adam back. Not only is Adam the head chef of Caxton Grill, he was listed as one of the ‘30 under 30’ to watch in The Caterer & Hotelkeeper’s 2013 Acorn Awards and recently crowned as the British Culinary Federation’s Chef of the Year, 2014. 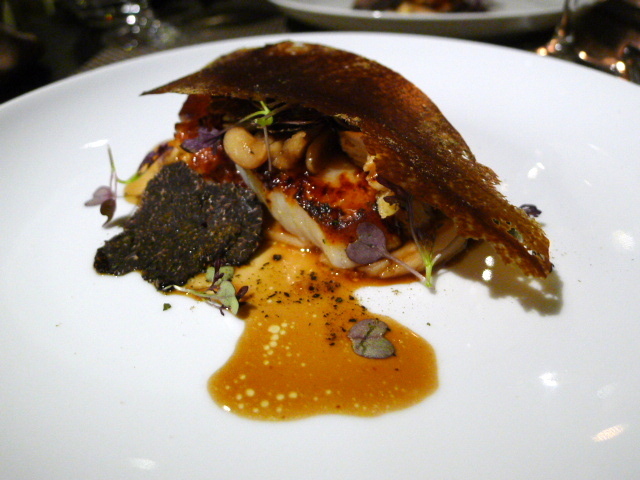 Adam started his cooking career at the age of 16 at the Gleneagles Hotel in Scotland. This was followed by positions at Rhodes 24, The Malmaison Hotel in Newcastle and the role of Head Chef at Fairmont St Andrews where he won two AA rosettes. At Caxton Grill, Adam cooks one part creative menu that is designed to excite, and another that is devoted to simple cooking of quality meats and fish from the Josper oven for more conventional palates. But in my view, if you are going to go to Caxton Grill, then a taste the creative inspiration that drives the ‘almost’ Masterchef winner is a must. 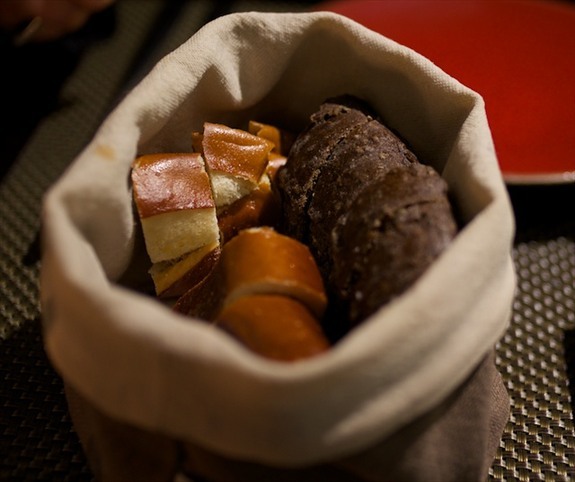 Our first interesting flavour experience was a breadbasket containing rye and bagel, and accompanied by a chicken butter with seaweed and mushroom. The rye was tasty, but the bagel was a dream with a centre that was lusciously soft, fluffy and wonderfully seasoned. The chicken butter consisted of 75% butter and 25% chicken fat and was supremely tasty with the seaweed providing the seasoning and the mushroom giving it an earthiness. Scottish salmon (£9), cured and slow cooked, was the height of gorgeousness. Not only was the salmon incredibly tasty, the slow cooking had also given the salmon the loveliest and softest of textures. 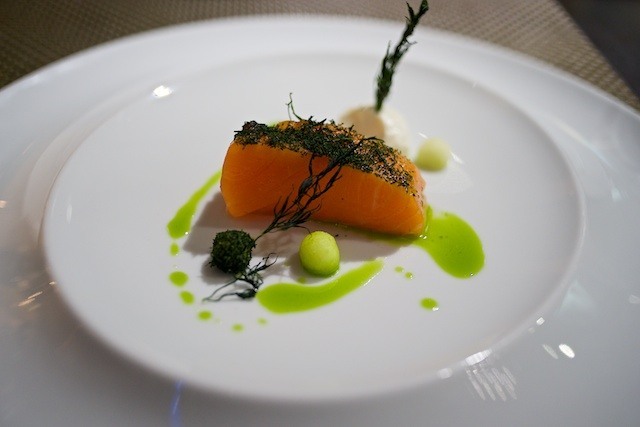 Accompanying the salmon was a wonderful goat’s cheese yoghurt for added depth, dill oil for aroma, and miso for an umami sensation. There were also some amazing jasmine pickled apples that were slightly sweet with a hint of acidity and a jasmine flavour. 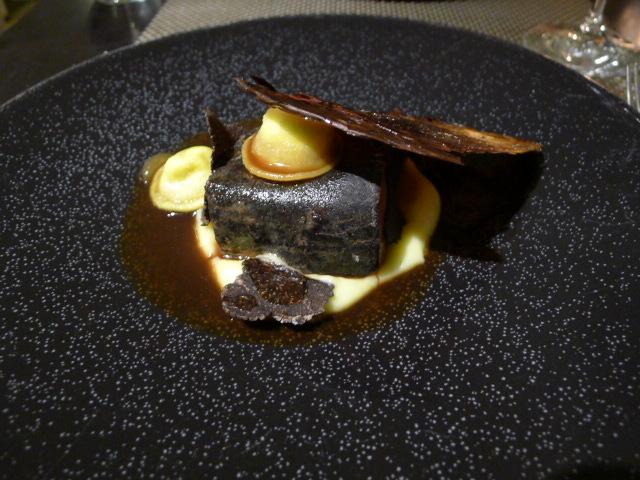 This was a really wonderful dish. Piglet belly (£10), glazed with a lovely sherry caramel, was moist, tender and packed with flavour. Confit octopus and pieces of squid sat perched alongside the belly. We enjoyed the octopus as it was really tender although we found the squid a touch chewy. 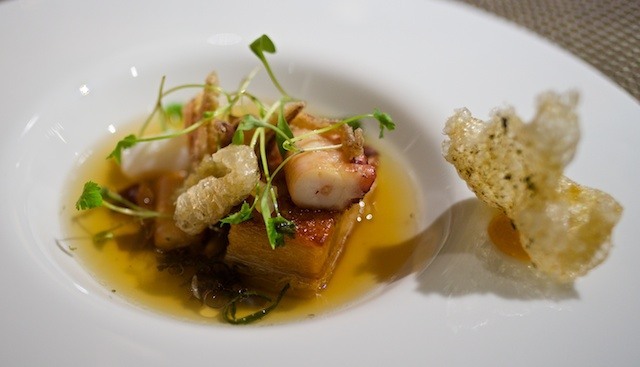 The dish was finished at the table with the pouring of a soy consommé that brought the whole dish together wonderfully with its unami overtones. As an added twist, there were tiny brunoise dices of ‘burnt’ confit lemon that electrified the dish with a hit of acidity. Two fat pieces of juicy Orkney hand dived scallops (£16) had been cooked to absolute perfection and were gorgeous. A hearty confit chicken was very enjoyable as were the nicely cooked cannellini beans. Little droplets of burnt lemon jel elevated the dish with its sharp yet dainty hits of acidity, and an interesting shitake mushroom crisp had been placed on top of the dish for a nutty lingering aftertaste. There were generous slices of truffle serving as garnish, although we found these a little bland. 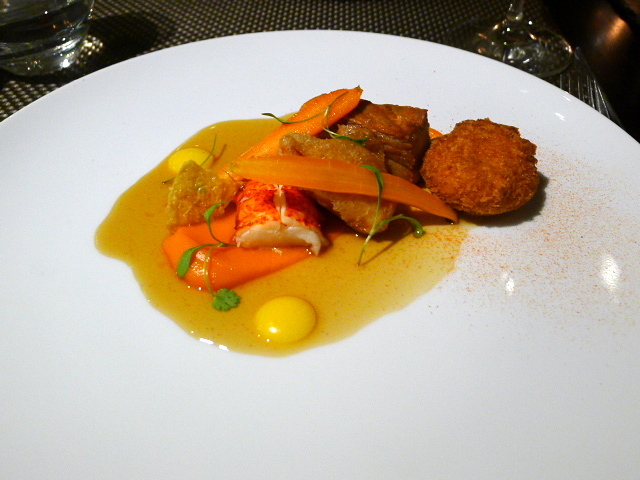 The dish of lobster (£35) with chicken, carrot and egg yolk was a variation of a dish that Adam prepared on Masterchef. The lobster had been served two ways, blanched and in a tempura batter which was a little soggy. The blanching produced a tasty result, although slightly less cooking time would have been preferable. A chicken leg terrine with sage and garlic was robust and hearty. The carrot element consisted of some delicious confit carrots and a sweet carrot purée. On their own, the carrots were really nice, but as a whole, we didn’t connect with the combination of the sweetness of the carrot flavour with the savoury delicacy of the lobster. Herefordshire beef fillet coated with ash and served with ‘burnt’ vegetables, ricotta and duck ravioli and truffle (£28) was rustic and satisfying. The beef was beautifully cooked, medium rare throughout and supremely tender. The use of the ash was well judged and it added complexity to the taste of the beef without overpowering its meaty flavour. The filling in the ravioli was excellent but the pasta casing proved to be a little thick. 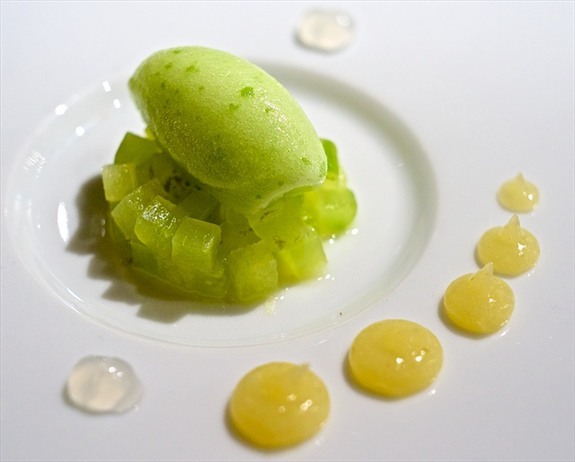 The pre-dessert was an excitingly refreshing combination of apple gel, gin and tonic gel, zingy apple sorbet and cucumber cubes. Dessert was a variation of textures of chocolate and passionfruit (£9) and consisted of a crunchy dehydrated chocolate mousse, a microwaved springy chocolate sponge, chocolate mousse, aero chocolate, nutella powder, passionfruit sorbet and chocolate sorbet. There were many elements to this dessert, but it all came together wonderfully and showcased a great range of skills and techniques. 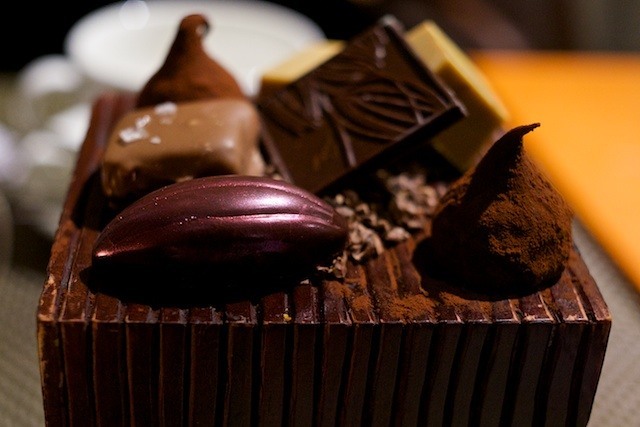 A variety of delightful chocolate petit fours rounded off the meal. At the tender age of 25, Adam Handling is truly a chef to watch. His food was tasty, elegantly hearty and comforting. There was lots of technique and energy on show and some wonderful combination of flavours. Adam has Michelin aspirations and it’s easy to believe he will succeed in achieving his goals. Caxton Grill deserves greater notoriety. Excellent food aside, Caxton Grill is also very smart to look at and comes with commendable service. 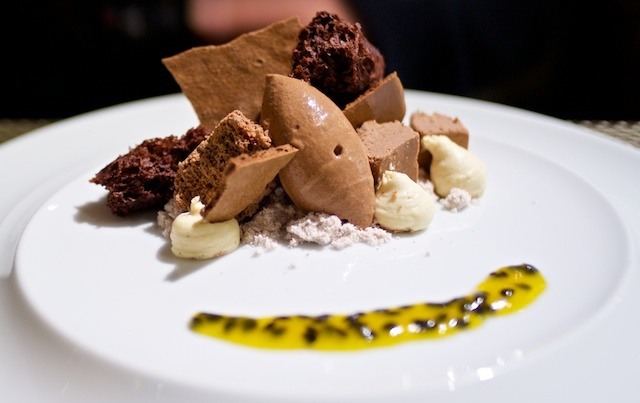 Prices: £42 to £60 for three courses, excludes drinks and service. Another place we loved eating at last year. One we’d return to. this is a fabulous restaurant. I think its great value for money as well.